A sprained ankle is a common sports injury, but can also happen any time a sudden twist displaces the ankle joint. Sprains often occur when wearing inappropriate shoes or walking on an uneven surface. According to the American Orthopaedic Foot & Ankle Society, 25,000 people are treated for ankle sprains every day. Inversion – when you sprain your ankle on the pinky toe side of the ankle. High ankle sprain – affects the upper part of the ankle between the foot and the shin. How Severe is Your Ankle Sprain? Ankle sprains are categorized into grades that define the severity of the injury. A Grade 1 ankle sprain is characterized by ligaments that are stretched or slightly torn. Though there may be some tenderness and swelling, you should be able to put your weight on the foot without too much pain. 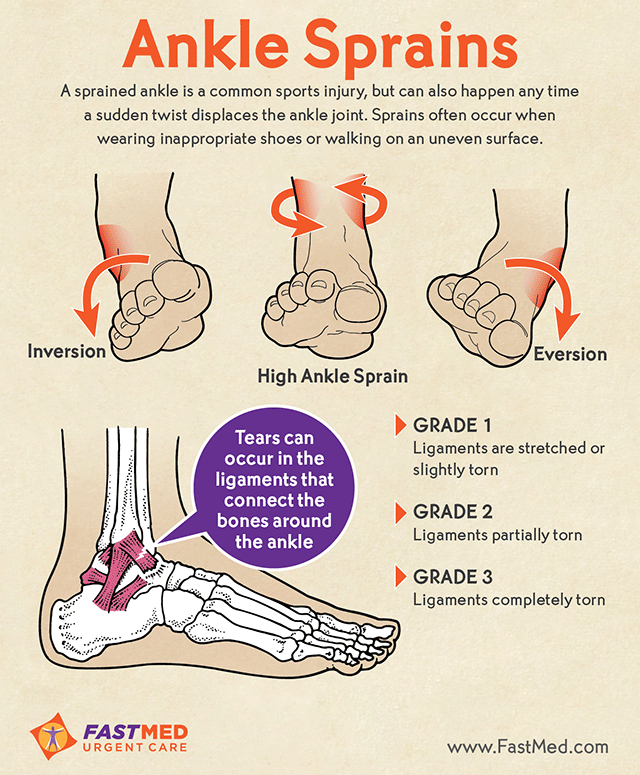 A Grade 2 ankle sprain means that the ligament is severely, but not completely torn. Swelling and accompanying pain is more pronounced, to the point that you may not be able to put your weight down on the foot. A Grade 3 ankle sprain constitutes a complete tear of the ligament. Swelling and pain is likely to be severe and you won’t be able to put your weight down the foot. If you have an ankle sprain, you should keep it elevated on a pillow and try to stay off of it as much as possible. A cold compress can help to reduce swelling. You may take medicines such as aspirin or ibuprofen, but if pain does not improve after 5 to 7 days, you could have a more serious injury such as a fractured or broken bone. If you have a painful ankle sprain, come to your local FastMed Urgent Care for an examination so we can help determine the grade of the sprain and the right course of treatment to get you back on your feet in no time!